Brand NEW Luxury Home!? 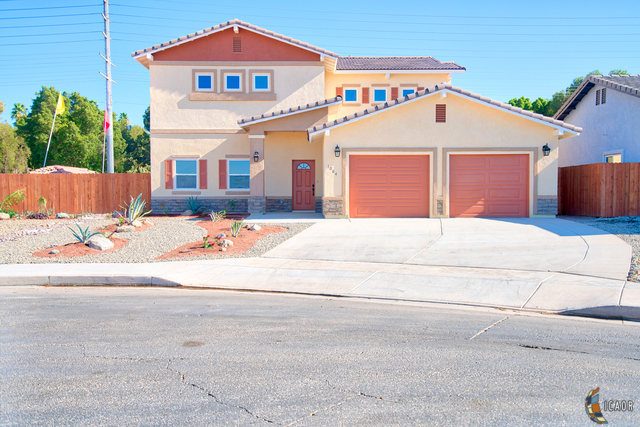 Hi, I&apos;m a brand-new home located at 1084 Ridge Park, a quaint and desired neighborhood in Brawley. You need to come visit me in person to view my beauty because words cannot even begin to describe it! I have a magnificent family room with a built-in entertainment center, perfect for movie nights. And my large, elegant kitchen is filled with top-of-the-line black stainless steel Samsung appliances, along with a two-tone kitchen, soft-closing cabinets, counter top with bar style seating and large walk-in pantry. I have 2 master bedrooms, one at each floor. Other 2 upstairs bedrooms have walking closet. Upstairs master bedroom has a unique retreat for office or relaxation. Beautiful ground floor wood style ceramic tiles are very desirable. I look amazing from the outside due to low maintenance, desert-style landscaping. 2 cars split garage is very large. A beautiful park is a walking distance. The country side and mountains view is very soothing and appealing.